Bottle Service Charge (18.00%) is a mandatory charge; paid to the venue upon arrival. It is NOT included in the package price. 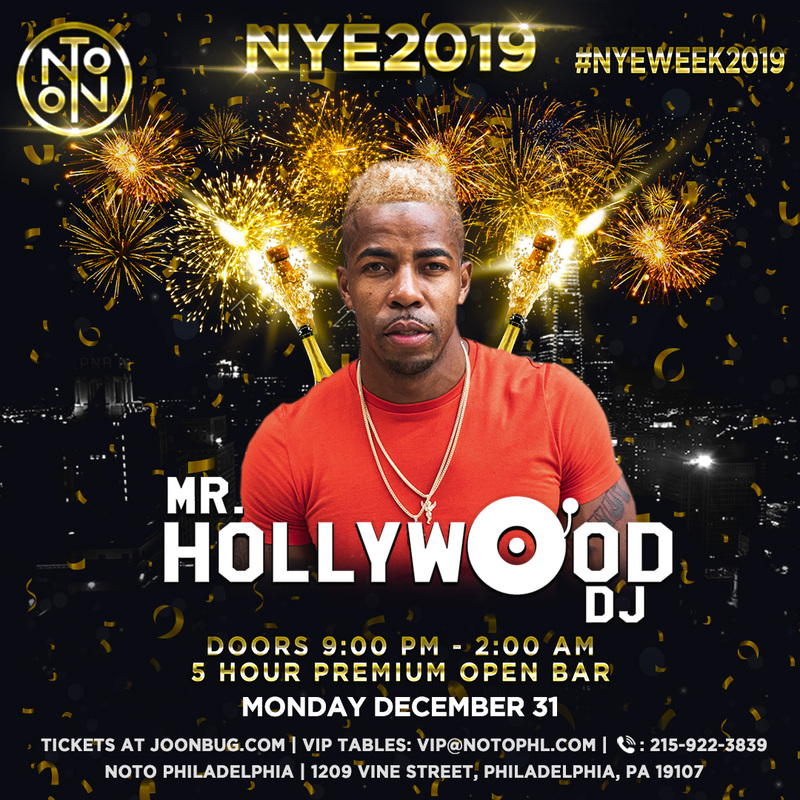 When it’s time for the ball to drop and the confetti to fall, get to NOTO in Philadelphia for a nightclub experience that puts the “playtime” back into New Year’s Eve partying. Renowned for being the area’s best members-only club, NOTO is opening its doors to the public to deliver an unparalleled NYE experience. Get fired up with delicious cocktails from a five-hour premium open bar before fueling yourself with complimentary lite snacks in the early evening. After you satisfy your palate, hit the dance floor as DJ Mr. Hollywood plays a thrilling mix of hip hop, house, and Top 40 hits. At the stroke of midnight, the crowd will gather for a live countdown to the New Year coupled with a complimentary champagne toast. To truly spend the night in luxury, opt for exclusive VIP ticket packages offering guests additional luxuries, such as bottle service and reserved seating in the VIP section. NOTO is an immense, bi-level nightlife citadel. As one of Philly’s premier mega-clubs, NOTO boasts cutting-edge technology, including HD screens and LED walls, all wrapped in luxurious design. Disco balls, mirrored subway tile, leather booths, and a massive chandelier are just some of the accents that take this party-haven over the top. Its next-level sound system is perfectly outfitted for its acclaimed program of top DJs including Travis Scott, Cheat Codes, Zedd, MAKJ and many more. Ring in this NYE with a history-making show and unstoppable party. Make your year-end party something to remember at a nightclub hosting this New Year’s Eve most exhilarating soiree. Secure your spot today for playtime at Recess Lounge.